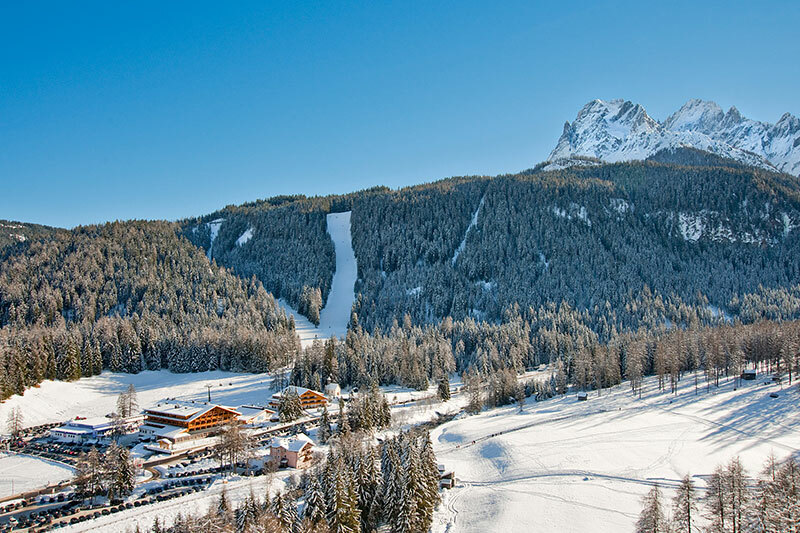 Located directly on the hiking trails and ski slopes of the Tre Cime / Drei Zinnen Dolomites ski area, our 4-star superior hotel in Sesto in Alta Pusteria is the right place for your spa, hiking and skiing holiday! Surrounded by fields and forests, the Bad Moos – Dolomites Spa Resort stands at the entrance to the Drei Zinnen/Tre Cime Nature Park, part of the Dolomites, a UNESCO world heritage site. It is one of the original spa hotels of South Tyrol, featuring its own sulphur spring and holistic health programmes. The resort’s Termesana spa and health area is spacious and offers high-quality treatments. Guests can stay in one of three buildings, each with its own individual style – exclusive, informal or romantic. The Bad Moos – Dolomites Spa Resort is one of the top hotels in the Drei Zinnen (Italian: Tre Cime) area of the Dolomites. The resort offers wonderful views of the nearby Sexten Dolomites, including Helm mountain, where the hotel is located, and the Rotwand peak. During their stay, guests can leave their cars in the underground car park as they can easily access a wide range of activities all year round. From hiking, mountain bike excursions and gentle walks, to downhill and cross-country skiing, you can join all the outdoor activities right outside the door.